Larry Kramer with Belenda Torres, the first-ever recipient of the scholarship he established for U.S. Grant High School. Photo by Brandon Snider. A Scholarship and Award Fund is a permanent endowment that offers a simple and enduring way to help students further their education. 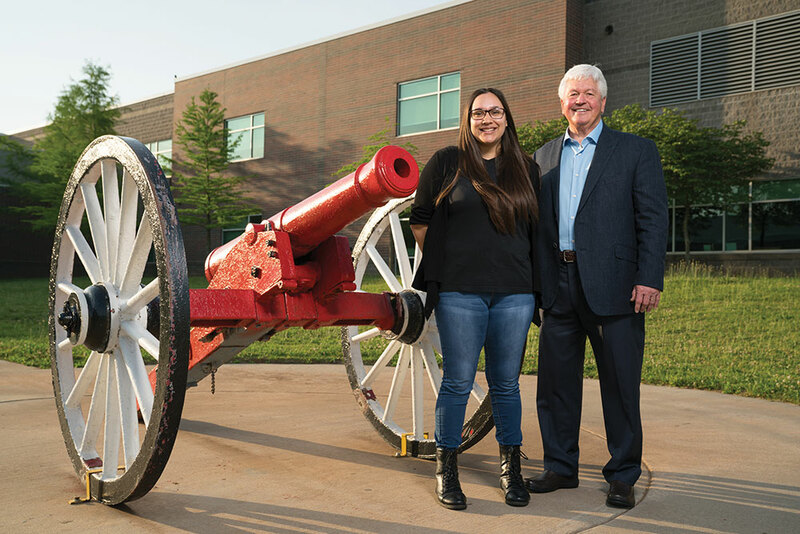 Through funds created by generous donors, the Oklahoma City Community Foundation awards $2 million in scholarships annually to 700 students throughout Oklahoma. Minimum initial balance of $40,000. This amount can be accumulated over time and come from more than one donor. You may also establish a named fund that supports scholarships awarded through our existing Trustee Scholarship Initiative programs. Supports an existing scholarship awarded through our Trustee Scholarship Initiative program and will adhere to the program’s pre-determined eligibility requirements. To find an existing scholarship that meets your charitable goals, review our Scholarship Directory of more than 200 scholarship funds. By making a gift to any of the scholarships we administer, you can help ensure that award amounts increase to meet rising education costs. Make an online gift and specify the fund name in the online giving form. Mail your gift to the Oklahoma City Community Foundation, PO Box 1146, Oklahoma City, OK 73101. Gifts to scholarship funds at the Oklahoma City Community Foundation can be made in many ways. By using assets other than cash, you can make a significant gift without impacting your current lifestyle. We even offer giving options that provide fixed payments back to you during your lifetime. Include a gift in your will or trust. Name the Oklahoma City Community Foundation as one of the beneficiaries of your retirement account or life insurance policy. Make a gift of appreciated securities, land or personal property. Use your annual required minimum distribution from your individual retirement account to make a tax-free IRA charitable rollover gift. To learn how we can help you with any of these gifts to scholarship funds, contact Jessica Schwager at 405/606-2917.